Beronda Montgomery is Professor of Biochemistry & Molecular Biology and Microbiology & Molecular Genetics in the Department of Energy (DOE) Plant Research Laboratory at Michigan State University (MSU). She completed doctoral studies in Plant Biology at the University of California, Davis and was a National Science Foundation (NSF) funded postdoctoral fellow in Microbial Biology at Indiana University. Since starting at MSU in 2004, Dr. Montgomery’s laboratory investigates the mechanisms by which organisms such as plants and cyanobacteria which have limited mobility are able to monitor and adjust to changes in their external environment. The ability of these largely immobile organisms to adapt their patterns of growth and development to fluctuations in external environmental parameters increases their survival and maximizes their growth and productivity. 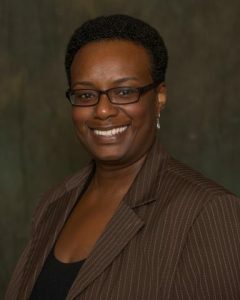 Dr. Montgomery’s scholarly efforts were recognized by her receipt of an NSF CAREER Award in 2007, being selected as a finalist in the 2014 Howard Hughes Medical Institute (HHMI) Professors Competition, and a 2015 Michigan State University Nominee for the Council for Advancement and Support of Education (CASE) U.S. Professor of the Year Award. In addition to her core research and teaching efforts, Dr. Montgomery is also actively involved in scholarly efforts to promote effective research mentoring and management and the inclusion and success of individuals from groups underrepresented in the sciences.